Did you know that your website is not the only place where you can place your live chat? And I’m not talking about our Facebook integration. You can extend the reach of your live chat customer service well beyond the pages of your website. You can have people starting a chat straight from your newsletters or from one of your Twitter replies. All that with the help of a direct link to your chat. When clicked, the link will open up a chat window, giving the users a direct way to reach your customer service. This can save a ton of time for social media managers who normally act as conduits between customers and your customer service department. Instead of trying to pass information between customers and your support via posts and tweets, social media managers can move the entire social media customer service directly to live chat. Feel free to click it and see how it works. The link will open a new page with our chat window. To get your unique chat link, login to your dashboard and go to settings > installation > direct chat link. The link is ready to use as it is. You don’t need the tracking code added to your site. If you have a pre-chat survey enabled, the recipient will have to fill it out before starting the chat. Once you have the link, it’s time to put it to work. One of the simplest and most effective uses of the link is to put it at the end of your social media customer service replies. Whenever a customer reports a problem via your Twitter or Facebook, you can add the chat link to you reply to provide some immediate way of contact. 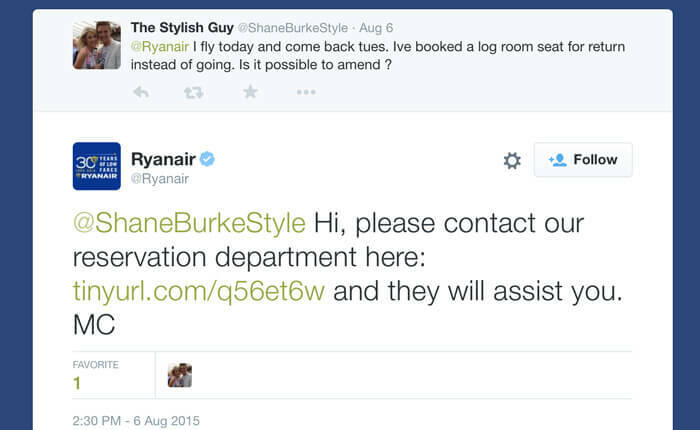 For example, Ryanair uses this method in their social media customer service to put the reservations department in touch with people who want to make a change in their reservations. Quick and easy! 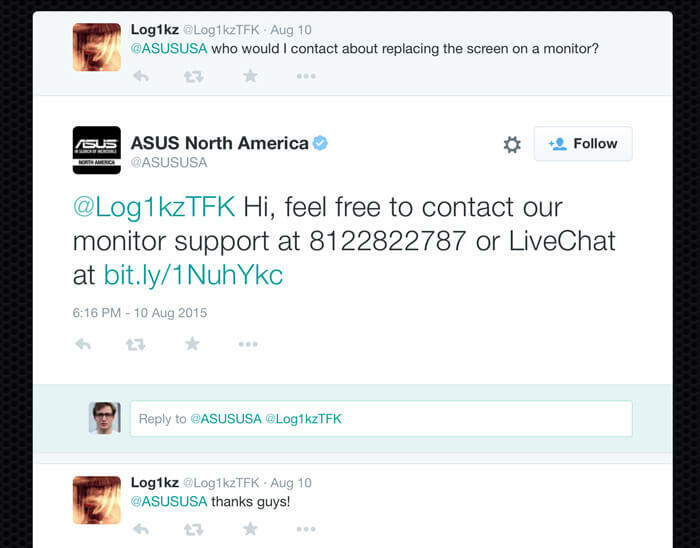 In a similar manner, ASUS uses the chat links to forward customer enquiries to their support staff. 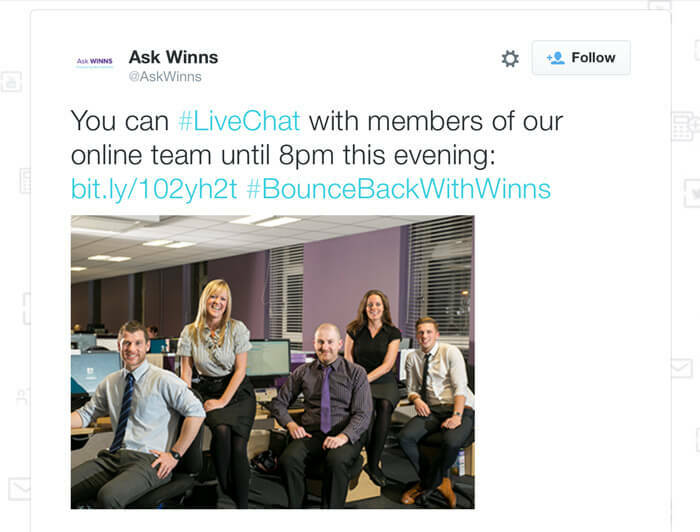 And some companies, for example Winn Solicitors, use chat links to introduce their live chat to their followers. Introducing a chat option to social media customer service is also useful when you need to ask the person for some additional details to solve the case and you don’t want to leak anything for the whole Internet to see. The link will give your social media managers a way to easily move cases from Twitter feeds and Facebook walls to your customer service team, which will leave them free to pursue other social media goals. And when you’re at it, make sure to use link shorteners. This is especially important in the case of Twitter where every character counts. You can use our free URL shortener to make your social media customer service chat links more compact. Just as your website is not the only place where you can use your live chat, social media managers are not the only team that can use direct chat links. Another group in your company that can use the links extensively are your customer service agents. In their case, it’s all about moving communication to the most efficient channel. Instead of having to provide lengthy, back-and-forth exchanges over email, they can add a chat link to their communication and encourage users to have their cases solved via a live channel. This can be either a link in the email text or in your email signature. The signature trick works especially well if you send a lot of emails to customers and you want to add a chat option to all of them. This way it will be always available without coming off as too pushy. In Gmail, which is probably your email service of choice, you can set up the signature by going to your Settings via the ‘Cog’ icon in the upper right portion of the screen. Scroll down till you see the Signature section. Enable it and enter your preferred signature. You can either use the Link button or use the Ctrl+K shortcut (Command+K in OS X) to add a link to your signature. Making social media customer service easier and moving your email communication to chat are not the only ways to use chat links. You can come up with super deep uses like sending chat links via text messages or turning your links into QR codes to post them in your offline shop locations. Maybe it’s time for some guerrilla chat marketing? Have a jab at them and see what you can come up with. And after you make your social media customer service more accessible, we want to hear all about it!